Within scope of “SME Networking Project”, “Strategy Workshop on Metal Kitchen Utensils” organized in cooperation with the Ministry of Economy and Kahramanmaraş Chamber of Commerce and Industry was held in the foyer of the KCCI. Mehmet Emrah Sazak; Head of the SME and Clustersing Department affiliated to the Ministry of Economy, Mustafa Anteplioğlu; Deputy Governor of Kahramanmaraş, Mustafa Uzunlar; Deputy Mayor of Kahramanmaraş, Kadir Gülkesen; Member of the Board of Directors of the KCCI, experts and many company executives participated in the workshop. Kadir Gülkesen; member of the Board of Directors of the KCCI, made the opening speech of the workshop. He stated, “With the value-added and employment it has brought about, metal kitchen utensils sector has become the second biggest industrial sector after textile sector in Kahramanmaraş, an industrial city. Kahramanmaraş produces %79 of all the kitchen utensils produced in Turkey and it is the biggest center in this sector in Turkey. Our sector is making progress in terms of investment and aims to produce goods with more added-value, increase exports, create brands and get more shares from the global market. For all these objectives, we need more subsidies from the government. With appropriate subsidies, sector has the determination and power to achieve these objectives. Through this workshop, we will identify our problems, assets and liabilities, solutions and the support we expect from our government and we will create a road map”. Mehmet Emrah Sazak; Head of the SME and Clustersing Department affiliated to the Ministry of Economy, stated that their purpose was to get together and consult with firms in the region and to create a road map for the metal kitchen utensils sector. He said, “We will make efforts so as to make our firms in Kahramanmaraş competitive and to create a road map. Together with this workshop, Sector Strategy Document, which will be composed of the desk research and field interviews by project experts, will be used as Needs Assessment for the URGE (promoting international competiton). For the next 3 years, with the KCCI, we will deal with the needs and problems of the firms in the city and take action for competition. We will try to ensure that they get into the market and to bring potential clients from abroad. We believe that Clustersing is not a purpose but a good tool. Globalization process has considerably changed the dynamics of competition. We want to explain cooperation culture to the sectors. Through this project, we will learn many things by experience in the next years. Together, we will see what our competitors are doing in the most competitive countries of this sector”. Mustafa Anteplioğlu; Deputy Governor of Kahramanmaraş, stated that a lot of investments should be made in innovation and R&D activities in order that enterprises can survive and increase their capacities. Mr. Anteplioğlu mentioned that the functions of the products are the same but the possibility of selling increases by adding various features such as ergonomics and fashion to the product. He added, “Firms should absolutely cooperate. Firms shouldn’t necessarily regard each other as competitors. Thanks to the networking (Clustersing and cooperation), our market share will grow. We will both increase the share of the sector and the share that firms will get from it. This requires close cooperation”. Then, Zeynep İyiler; Head of Unit of the General Directorate of Export affiliated to the Ministry of Economy, did a presentation on the Declaration on the Development of International Competitiveness No.2010/8 and the perspective of the Ministry towards Clustersing. She also discussed the support which will be provided by the KCCI to the firms in the Metal Kitchen Utensils Sector. This support covers Service such as training, consultancy, marketing abroad, procurement team and the consultancy Service that firms would be able to receive for 3 years after the end of the project. Then the Workshop began and by means of SWOT Analysis, the participants worked together on a future strategy development. The Sector Strategy, prepared with the views and contributions of the firms, will be published on our web site in the next period. 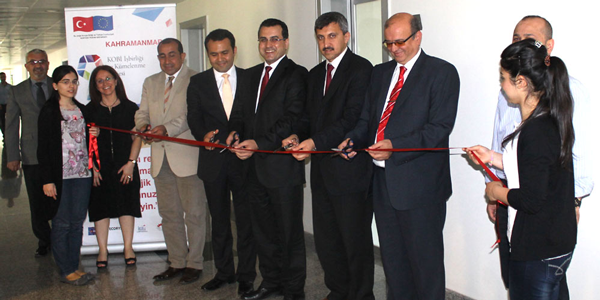 On the same day with this activity, Kahramanmaraş Clusters Info Spot coordinated by Aygur Öngel, was opened.